+44 (0) 1506 443058 | Component cleaning and fluids. Soldering products. Solvent cleaning is a beautifully simple process that can be very effective and easy to manage for the right application. With the use of low boiling point non-flammable products such as the Opteon™ range of solvents you can effectively clean your components to an exceptionally high standard with minimal cost and capital investment. Download our latest brochure here, for an expert guide to the solvent cleaning systems we can offer – for a cost effective, environmentally friendly solution to your precision cleaning needs. 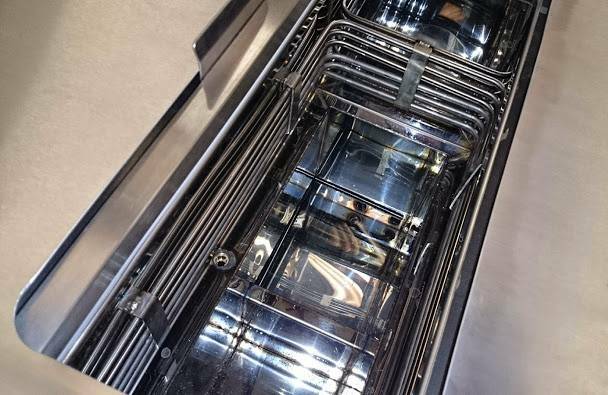 The solvent process has three stages – cleaning, rinsing and drying. This is typically done by immersing the parts in the liquid, which can be agitated either by spray under immersion or the use of ultrasonics for around 2 to 5 minutes. Vertical agitation and/or rotation can also be used at this time to help flush out tight spaces and blind holes. This is performed in the vapour zone. Boiling the solvent in a separate vapour generator creates a pure vapour zone above the wash tank, which then condenses on the components to rinse any final residue that may be in the immersion tank. This ensures the components are cleaned to a very high standard despite any contamination that may build up in the rinse tank. It also provides a pure distilled solvent that is returned to the rinse tank, keeping this stage clean. This stage also heats the components up to the boiling point of the solvent, ensuring effective drying. This final stage takes place in the free board area of the system, surrounded by cooling coils, which de-humidify this zone of the process causing the now warm parts to dry very quickly. As the solvent evaporates it is captured by the cooling coils and returned to the rinse tank ensuring minimal losses. 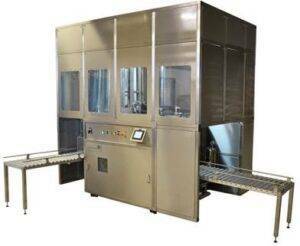 This self-cleaning significantly reduces process maintenance. 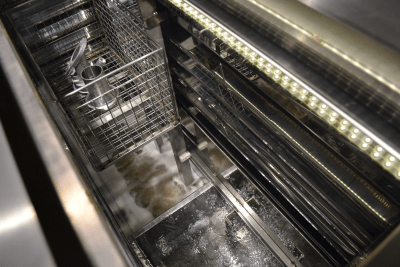 Typically, all three stages are carried out beneath a sealed lid ensuring no solvent is lost during normal operation, minimising the cost of the cleaning process. 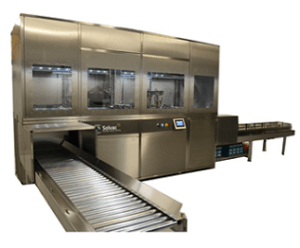 The Solvac S1 ultrasonic cleaning and vapour degreasing system includes a single processing sump and an offset vapour generator sump to produce a constant layer of controlled vapour for rinsing. The range can be fitted with a choice of ultrasonic options from bonded transducers to easily removable push-pull resonators. Fully enclosed models also available. Removal of organic residues, grease, fingerprints, oils, films, mould release, etc. 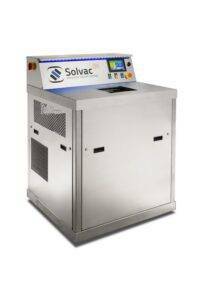 The Solvac S2 and S3 solvent ultrasonic cleaning systems offer two levels of automation. The S2 has a robot which processes the basket but the operator must load the basket on to the robot arm. The S3 (pictured opposite) is completely automated and usually incorporates conveyors from which the robot can shuffle multiple baskets through the system, increasing throughput and process times. Both models come with pneumatically sealed lids and doors as standard. 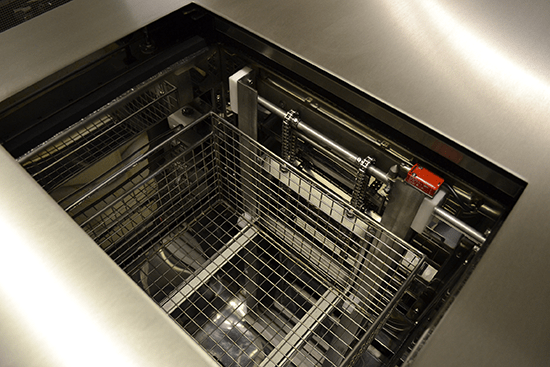 The S2 and S3 models have a unique patented LoadLock Canopy area that minimises solvent emissions and completely isolates the process chamber from the operator at all times. These systems are considered sealed machines. 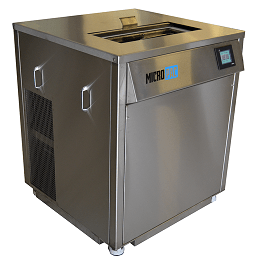 Micropac is a cleverly compact, high performance precision parts cleaning system. The ideal answer for smaller precision engineering, optics and electronics component companies. Easy-to-use, the Micropac system tackles a wide range of soil types on precision components, but conserve valuable floor space, energy, and budgets. A benchtop model is also available. Parts come out clean, dry and ready to use. © 2018 Fraser Cleaning Technologies Ltd.